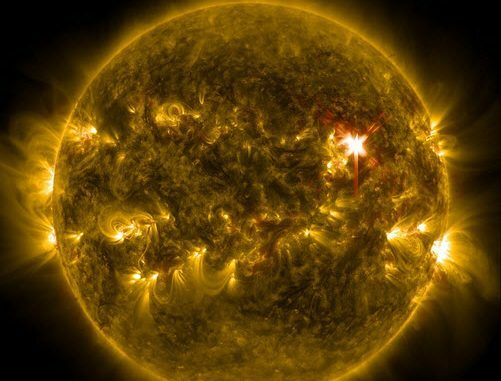 A new analysis from researchers at Berkeley and Harvard strengthens the hypothesis that sunlike stars are formed two at the time. So, did our sun have a sibbling when it was formed some 4.5 billion years ago? Most likely so, says a theoretical physicist from UC Berkeley and a radio astronomer from the Smithsonian Astrophysical Observatory at Harvard University. They base their assertion on a radio survey of an enormous molecular cloud in the constellation Perseus – a cloud filled with recently formed stars. There is a mathematical model that can explain the observations from Perseus, but only if all sunlike stars are formed together with a companion. “We ran a series of statistical models to see if we could account for the relative populations of young single stars and binaries of all separations in the Perseus molecular cloud, and the only model that could reproduce the data was one in which all stars form initially as wide binaries. These systems then either shrink or break apart within a million years,” says co-author Steven Stahler, a UC Berkeley research astronomer. In their study, “wide binaries” means that there are two companion stars that are separated from each other by more than 500 astronomical units (AU). 1 AU equals the average distance between Earth and our sun, i.e. 93 million miles. If our sun would have a wide binary, that companion star would be at least 17 times farther away from our sun than the distance between our sun and the planet Neptune. Stahler and Sadavoy posted their findings on the arXiv server in April 2017, and their paper has been accepted for publication in the Monthly Notices of the Royal Astronomical Society. Our sun – did it have a companion? It has been known since long that many stars have companions. Alpha Centauri, the solar system located closest to our own, does for instance contain not just one or two but three stars. Because of the prevalence of solar systems with two or more stars, astronomers have long tried to find an explanation as to why. Can one star pull another in? Or was there two or more stars in the system right from the start? Astronomers have also been searching for a companion to our sun – and even given this companion, should it ever be found, a name: Nemesis. The reason behind this rather hostile name is a hypothesis according to which the sun’s companion star kicked an asteroid into Earth’s orbit 66 million years ago; an asteroid that caused a mass extinction in which some three-quarters of the plant and animal species on Earth died out. If Sadayoy and Stahler are right and sunlike stars always form with at least one companion, then Nemesis have actually existed. “We are saying, yes, there probably was a Nemesis, a long time ago,” says Stahler. Based on Sadayoy and Stahler’s model, the sun’s companion most likely escaped.